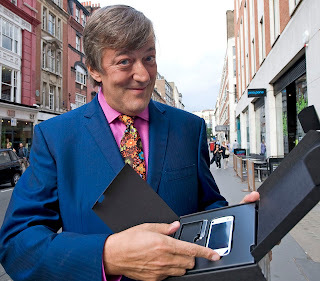 Last Monday, I went with a friend to see Stephen Fry live at the Royal Festival Hall in London. That is to say we went to the nearest Irish cinema (Dundrum, Dublin) which was transmitting the live feed from London. By misfortune of my geographical roots, I live in Ireland so couldn't get to the live show. Lucky ducks who got to see him in the flesh. The transmission was beamed to 60 cinemas across Britain and some in Ireland. I've been a fan of the Fry for about 2 years now. I think he's an unassuming superstar. Love his books, TV programmes, wit, humour, self-deprecation, and all around niceness. Plus he knows everything there is or ever was to know in the world ever. The reason for this little experiment was in essence to promote his second autobiography 'The Fry Chronicles'. I enjoyed the first volume 'Moab is my Washpot' muchly. It covered his life from early childhood to his arrival in Cambridge University where he is to meet Hugh (the god) Laurie and Emma Thompson. This is where I start to get really intrigued as I'm a huge fan of Hugh and Emma also. Anyway the show was a real joy for Fry fans. Aside from a smidge of technical difficulties at the beginning. There was audible frustration and disbelief from the audience as the letters 'bad transmission' appeared on the screen every 3-4 seconds. But it calmed down thank god. “It’s an evening that has been all too short for me, and all too long, I suspect for you,” he concluded.